Veneers vs. Lumineers: Which Is Better for Your Smile? Home / Articles / Veneers vs. Lumineers: Which Is Better for Your Smile? In the world of cosmetic dentistry, few things match the power of veneers in terms of transforming a smile. If your grin has been blemished by stains, chipped teeth, cracked teeth, a damaged tooth structure, or any other tooth surface imperfections, veneers offer a fantastic option to restore a megawatt smile. If you landed here in search of a way to turn your grimace back into a grin, you’re in luck. 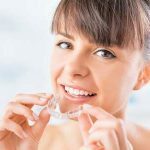 We will break down everything you need to know about porcelain veneers and Lumineers and which one is better for your smile. If you wanted to learn more about the popular rock band The Lumineers, we can’t help with that…but do stay a while! We might convince you to do something good for your smile. To get started, let’s clear up some confusion in the terminology: Lumineers ARE veneers! The general meaning of veneer (as it relates to cosmetic dentistry) is a layer of protective material placed over a tooth.Think of each one as a contact lens for a damaged tooth. They offer a little protection and make it look natural and a lot better. There are two different types of veneer that you will be offered at your initial consultation and they are based on the material that is used to create them: porcelain or composite. Lumineers are a specific type of veneer made only of porcelain, whereas other types of veneers can be made from composite material. 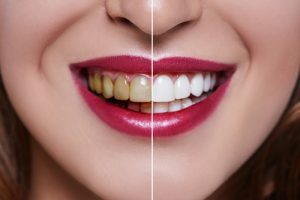 Any veneer you choose should improve the appearance of your smile; however, there are a few drawbacks with each of them that you should be aware of before you make your final decisions about cosmetic dentistry. So, which is it to be: Lumineers or veneers? Read on. Perhaps the single greatest “pro” in favor of Lumineers is that they require little to no prep work on your existing teeth. For those who already cringe when it comes to even minor dental work, or get squeamish when it comes to a simple filling, the ability to bypass the drilling and grinding associated with other veneers is a huge plus! The idea of having your own teeth drilled down is not particularly appealing to most people, for good reason. 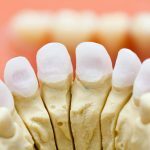 Before placing traditional porcelain veneers on your teeth, a dentist will drill or grind down approximately a half millimeter of your existing enamel to create room for the veneer placement over your teeth. This is certainly a “con” for many, but there is also a flip side to the “no prep” Lumineers that must be considered as well. Lumineers are extremely thin; however, patients can still end up with what is described as a small ledge at their gum lines. This, in turn, can lead to plaque getting trapped and gum sensitivity and gum disease. It is especially important to maintain good cleaning habits to help prevent this. A traditional veneer may offer a preferable fit because the teeth are contoured beforehand. The Lumineers, as mentioned above, are extremely thin and placed directly on the existing teeth, so there is the risk of that ledge at the gum line, which may cause some discomfort.While all veneers are intended to provide a durable solution for wearers, there is also some level of risk involved. For example, patients who already grind their teeth run a higher risk of cracking the veneers and are advised to wear night guards. The durability of all veneers, porcelain or otherwise, is affected by the cleaning habits of the wearer. Brushing and flossing regularly, as well as maintaining routine dental cleanings, will certainly extend the life of veneers. And dropping the bad habit of ripping open various bits of packaging with one’s mouth is an absolute must once you have veneers! Resist the urge to use your teeth as a “tool” if you want to prevent your veneers from being damaged. Plus, veneers are a considerable investment (we will get to this in “cost” below) so the last thing you want to do is damage them by using your mouth for a job best left to a pair of scissors. Working as both a pro and a con for the Lumineer is its color. Because they are extremely thin (which provides the benefit of little to no prep work), they cannot carry as much depth of color. This means that a Lumineer may not be as effective in covering deeply discolored teeth. If the primary motivation for the patient is to color correct their smile, then a traditional veneer may be a better solution than a Lumineer. On the other hand, Lumineers are thought to mimic a more natural tooth color than other veneers. (Anyone who recalls Ross Geller’s over-whitened teeth on Friends will know just how startling and embarrassing a “too white” smile can be!) An important topic to discuss with your dentist is how you can achieve the most natural-looking result. Lumineers pack a promising punch with their minimal tooth preparation and natural look, but that punch also comes at a cost. Lumineers are typically going to cost 30–40% more than traditional veneers, making them a cost-prohibitive choice for some. A number of factors will be involved when it comes to determining the cost of any type of veneers (which can be as low as $200 per tooth and as high as $2,000 or more per tooth). These factors will include the type of material used, the number of teeth to be covered with the veneers, the location of the dental practice, and more. As you discuss cosmetic options with your dental provider, you should ask for a clear outline of the costs associated with veneers. It is also a good idea to compare the costs to other treatments that may achieve your desired end goals, including whitening treatments, dental bonding, braces, or other procedures. Whatever option you choose, be sure to ask your dentist for a clear list of all the pros and cons so you can make an informed choice and find the fit that is right for your smile—and your checkbook, too!